We’ve picked half a dozen wines from our range for our August special offers – a pair each of entry level and mid-range wines, and two more at the cheap end of special. 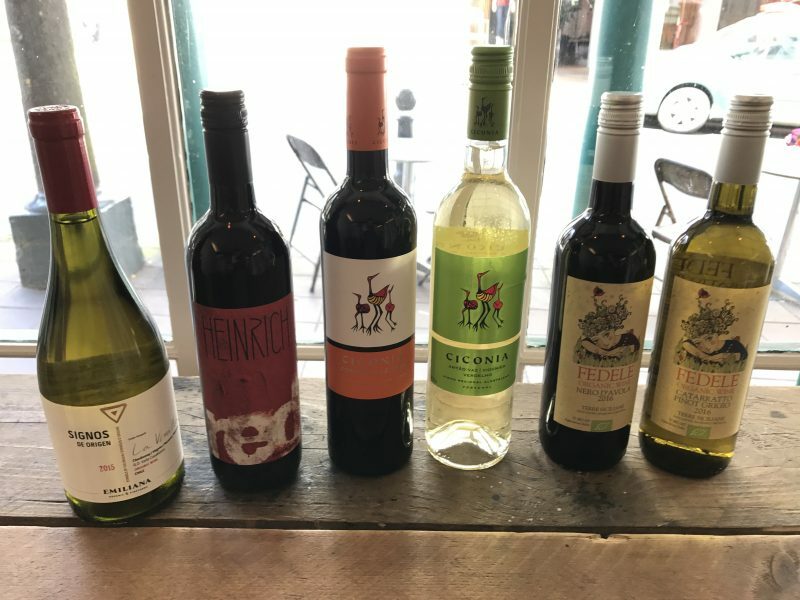 They’re all available by the glass in Ben’s Wine & Tapas so why not come and try them, and hopefully you’ll find something that works for you. Buy any two bottles and save 10%, or pick up a mixed case of six and get 15% off. We’ve been selling the entry level Fedele wines for the last year and now, for a mere 50p a bottle more, we’ve moved up a level. They’re a different class and I can’t think of a better way of spending an extra ten bob. Traditionally, Catarratto was grown for making Marsala and, by itself, it has a bit too much of a full-on blast of rich lemon, but the addition of 40% Pinot Grigio really works – toning it down and adding a dash of tropical fruit to the citrus mix. Nero d’Avola is Sicily’s ‘go-to’ red grape and produces wine that ranges from flabby, slightly sweet, fruit cocktail like wines to far more serious. Fedele Nero d’Avola is fun but, at the same time, a pretty decent glass of wine – packed with red berry fruit flavours but well balanced. This one is good with red meat and tomato-based pasta sauces. Also perfect for the barbecue – and I don’t mean lighting it! Our mid-range pair comes from an ethical Portuguese winery near Evora in the Alentejo region of Portugal – Herdade di Sao Miguel. Named after the white stork that is native to the area, Ciconia Branco and Tinto stood out at a recent tasting as being great value, extremely drinkable and robust enough to pair with most foods. In general Portuguese wines seem to get less traditional and more interesting the further south you go, and the wines of Herdade di Sao Miguel are a case in point. They aren’t a small producer but they have a long standing commitment to doing the right thing; both socially and environmentally. Sheep graze the vineyards to control weeds and fertilize the vines and the estate has planted 50,000 trees in the last 20 years as part of a reforestation programme. Find out more on their website at http://www.herdadesaomiguel.com/. The importers, Raymond Reynolds, even claim it goes with smoked haddock. Raymond is due to host an evening in Ben’s Wine and Tapas in the autumn so I might hold him to that. The red, Ciconia Tinto (also £9.75), is made from Touriga Nacional, Aragonez and Syrah grapes and is constantly picking up gongs for brilliant value for money (Wine Spectator and others). Ciconia Tinto combines approachability with Alentejo’s most likeable features of rich, soft fruit, with a bit of roast and dried fruit notes. Unoaked, and doesn’t need or want for it. This one pairs well with Mediterranean food in general, pasta, lamb, poultry and soft cheeses. We also have Herdade di Sao Miguel’s single varietal Ciconia Touriga Nacional (£10.99) and the slightly more funky and expressive Art.Terra Organic and Art.Terra Amphora (both £18.50) but these aren’t on offer. A brilliant ruby red with bags of vibrant cherry, red fruit and a hint of spice. Good, fruit driven style with supple tannins and a hint of old oak. The Wine Gang said ‘lovely nose with the barrel component obvious, but the Rhônish blend of Chardonnay, Marsanne, Roussanne and Viognier has a creamy apple depth too. Really nicely done: flooded with sweet, rounded pear and apple, but the acidity never wavering and the oak adding lovely support. A nicely weighty white to take on pork perhaps.’ And so say all of us. Prices above for a single bottle, 10% off if you buy any two or 15% off for a case of six. Mix and match as you choose – why not try one of each?